Lenin realized that in the economic sense Russia was not ready for the introduction of Socialism. He argued, however, that, though Russia remained too backward to build a viable socialist society on its own, she would be able to do so after a wider world revolution which would create a socialist Europe. Lenin was firmly convinced that Russia would not be left on its own, that her bold step towards Socialism would be supported by the highly developed countries of Europe which stood on the threshold of a world socialist revolution. Therefore it was the duty of Russian working classes to overthrow their own bourgeoisie and detonate a European revolution. Thus, Lenin augmented the Marxist theory to put Russia, its working classes and its Marxist revolutionaries in the vanguard of the struggle for socialism, ahead of all advanced capitalist countries. There was one more important reason why Lenin urged his comrades to get ready for a socialist revolution. He saw that the current unstable situation in Russia presented the Bolsheviks with a unique opportunity of taking the reigns of power in their hands. Once they were in control of Russia, they would be able to implement policies necessary to overcome Russia’s economic and cultural backwardness and make the leap into Socialism. He was prepared to gamble as he saw that his chances were high. Lenin liked to quote Napoleon: ‘On s’engage et puis on voit’, first engage in a serious battle and then see what happens. Being a ‘practitioner’ of revolution, rather than a pure theoretician, he had always had a streak of recklessness and adventurism in him. Lenin’s analysis of the political situation in Russian and of the behavior of the liberal and moderate socialist parties during the first several weeks after the collapse of autocracy would be completely vindicated by the subsequent course of events. 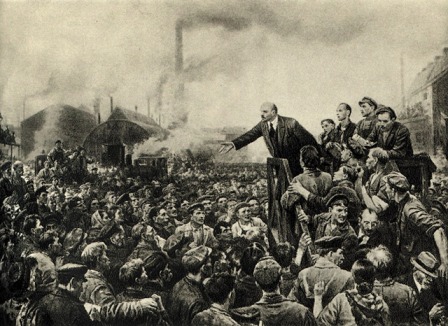 Lenin saw more clearly than most of his party comrades that the vacillation of the ruling political bloc, represented by the Kadet, Socialist-Revolutionary and Menshevik politicians in the Provisional Government and the Petrograd Soviet, would inevitably destabilize the situation in the country. It looked increasingly obvious that they were unable to meet the social expectations and demands of the popular masses and, first of all, to end the war, give land to the peasants and improve food supplies in the towns. It was precisely the underestimation by the ruling circles of the degree of urgency and explosiveness of those issue, the procrastination over reform and the continuation of the war that played into the hands of the extremist forces of the Left. They now had a good chance of gaining the support of the masses and seizing political control. What was needed, thought Lenin, was the right choice of strategy in the struggle for power. "Ready to Take All Power"
"All Power to the Soviets"